As the Cape May Bird Observatory’s Seawatch Migration Count season comes to a close, it’s only natural that we take a moment to reflect on the highlights of past 3 months. Overall this season has been fantastic, if not a little weird. With 70-degree weather in December, late-season big Scoter and Red-throated Loon flights, and rarities like Sooty Terns and a Masked Booby, it’s been anything but boring. As most of you are probably aware, Cape May Bird Observatory’s Avalon Seawatch moved to a new and improved location, complete with a beautiful little hide to keep counters and visitors sheltered from the elements. Now located directly on the beach between 8th and 9th street in Avalon, counters and visitors alike have an over 200°, unobstructed view from which to enjoy the spectacle of seabird migration. An aerial map of the Avalon coast is a perfect way to see some of the benefits of the new Avalon Seawatch location--a wider field of view that is closer to the main flight line! When asked about the new location, local birders have some pretty positive things to say. Michael O’Brien thinks it’s fantastic that you can now get prolonged looks at birds as they make their way past the end of the jetty and around the corner, which is when they are closest to shore. Mark Garland feels the new location, complete with the shack that allows visitors to get out of the elements, gives the count a new sense of professionalism and makes it a better destination for birders to visit while in Cape May. The benefit of being directly on the beach and behind the jetty are instantly obvious to most birders, with shorebirds, gulls, and terns feeding and resting just a stone’s throw from you. In fact, the counters and a few well-timed visitors have been treated to Red Phalaropes and Black-legged Kittiwakes who decided to take a break on the beach in front of the shack. For the counters, the new location has so many benefits. For the first time in the 5 years he’s been involved with the Avalon Seawatch, Migration Count Coordinator Tom Reed finally feels like he is a part of the count, with birds flying directly in front of him, over him, or even sometimes behind him. At 7th street, the counter had a restricted field of view that was pretty far from the flight line and therefore removed from the action. Primary Seawatch counter, Skye Haas feels the new location results in greater accuracy. He has double the time to precisely count flocks of Scoters or pick out each species in a large mixed duck flock. Skye also noted that thanks to the new shack, on days with less than desirable weather he doesn’t have to battle with the wind shaking his scope tripod or the raindrops blurring his binocular view. Instead, he can devote all of his energy and focus to the count. With any kind of change there inevitably comes doubts and unknowns, but there also comes new opportunities. There is a beautiful relationship blooming between CMBO and the city of Avalon, who has been hugely supportive and excited about the new location. Overall, this experiment has been a very successful one and goes to prove that sometimes you don’t realize something is broke until you fix it! If you haven’t made it to Avalon this season, the count goes til December 22nd so you still have a couple days. I encourage you to visit and experience it for yourself. So what is going on and, in particular, what is going on this year? Well we often do have a relatively mild spell in the run up to the holiday season, but this year it is even more mild than usual. Why should this affect the birds? Well, strange as this might sound, feeding birds is not as straightforward as you might think and often the birds 'know' better than we do. Rest assured, I am not going to tell you not to feed your backyard birds, but I would certainly encourage you to think about what food you put out, how, and when. Exactly why there are no birds at your feeder right now will depend on where you are and what species of birds you typically get. For many of us in the Mid-Atlantic States, a large number of the birds at our feeders will be winter visitors from the north. 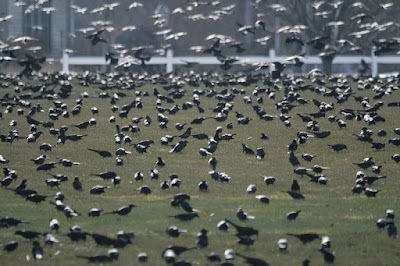 These birds are escaping the worst of the weather and will remain until well into spring before heading back north. Species such as Dark-eyed Juncos and White-throated Sparrows are typical of this group, but may also include birds such as Northern Cardinals and American Robins, which are both resident and migratory. Put simply, these birds appear not to be at our feeders yet simply because it's still so mild so they really don't seem to have headed our way in any great number yet. Other feeder birds include our local residents, such as Tufted Titmouse, Carolina Chickadees, Carolina Wrens, Downy Woodpeckers and the like. 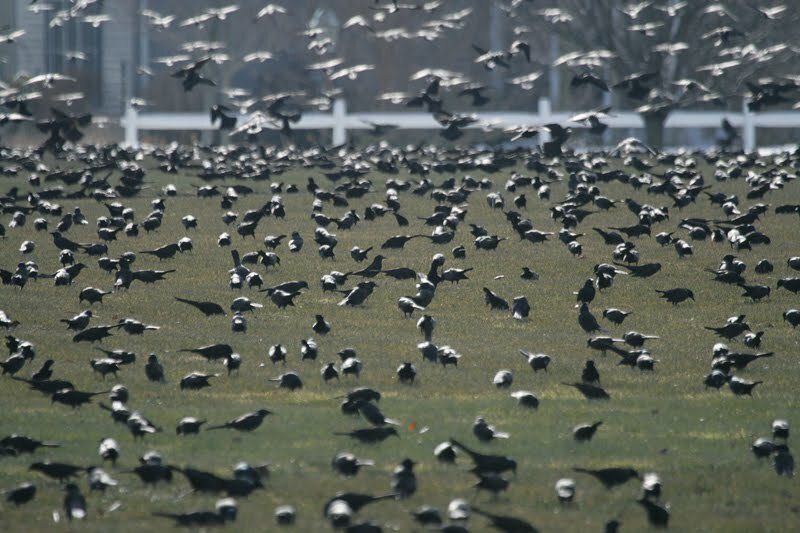 These birds will still be in your area, but they will be feeding elsewhere. What does this mean? Well, the answer is twofold; firstly, feeders are not exactly the most comfortable of places to hang out for many birds. There is much jostling for position and any number of potentially stressful situations. It's a bit like comparing a dinner for two at a quiet, back street restaurant with the hustle and bustle of a food stand at a carnival parade! Secondly, there's plenty of natural food still out there, since there's been very little frost to shrivel the berries, and no snow to cover the ground. So, there's plenty of natural food out in the wider countryside, where birds can feed comfortably, at a natural pace, without all the hurly burly of the backyard feeder and all the undue attention and rivalry from other birds. But there are other issues with feeders too. The unnaturally high density of birds can be a magnet for local predators, whether it be Cooper's Hawks or the neighbor's cat - again putting undue stress on the birds, since they need to be constantly on the lookout for such threats. Then there's the problem of infectious diseases; such diseases may be more readily spread around bird populations if they are not only in close proximity with each other, but also stressed. 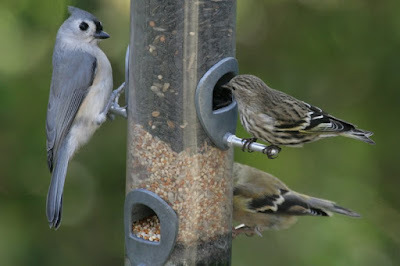 Finally, research in the UK and New Zealand has revealed that the type of feeding opportunities that backyard feeders provide tend to encourage the 'bullies', the species which dominate at such locations, which in North America includes non-native species such as European Starlings and House Sparrows. It may be starting to sound as though we shouldn't be feeding birds, but that isn't entirely the case. You should consider very carefully how and when to feed; don't put your feeders close to places where predators might easily lurk within catching range, such as close to shrubby borders or edges; don't put out large amounts of food - it's better to put little and often, and let the food run out for a short while between feeds. It's also good to put out as wide a range of foods as possible to provide a balanced diet. But do remember, if you do put out food, it is vital to keep it going during hard weather, since that artificially high population of birds that you have created may become dependent on the food during such periods. For the very best advice on feeding birds, we have a great range of publications available at our stores, and our staff will be happy to advice you on best practice, based on sound research. ...and once the 'pack' really arrives, there's little room for anyone else and less aggressive species will choose to move away from your yard, as has been shown from recent studies. Here, a juvenile Brown-headed Cowbird is the only one brave enough to stick it out at the lido! If you put up artificial feeders, those with individual feed ports have been shown to be less stressful for the birds than hopper types - Tufted Titmouse, American Goldfinch and Pine Siskin all manage to find a space here at the Northwood Center feeder. The high number of birds visiting some feeders creates ideal conditions for infectious diseases to spread. In Eastern North America, a form of conjunctivitis is virulent in House Finch populations and it is imperative that high standards of hygiene are maintained at backyard feeders to prevent this, and other diseases, from becoming a major concern. Through research studies, aggressive species have been shown to become even more prevalent in areas where there are significant backyard feeder opportunities. Although Common Grackles are native to our region, they naturally form roving flocks in the winter that move constantly through an extended home range. Keeping backyard feeders well stocked could be encouraging them to target specific locations more often than they would naturally; this not only enables an even larger population of these aggressive birds to develop, but can have negative impacts on other species, causing them to move away from the area. Though we might think we know best, nature usually does offer the best solution to natural problems. Feeders are fine in moderation, but do consider also providing natural foods so that a wide range of birds can enjoy your natural space - and you'll enjoy them too! Eastern Bluebirds are regular visitors to our pokeweed patch, which is growing well away from the feeders on the other side of the house and away from any 'bullies' that might drop by. And finally, don't forget that water is vital to birds, especially during prolonged cold spells. Cedar Waxwings are exciting birds that can be attracted to the garden by keeping one or two native red cedars in the corners of the yard, but they need plenty of water to help them cope with the astringent berries.